Our Abpromise guarantee covers the use of ab12793 in the following tested applications. 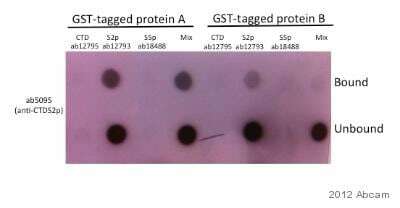 ab12793 RNA polymerase II CTD repeat YSPTSPS peptide - phospho S2 0.1 µg/ml was mixed with GST tagged recombinant proteins in vitro in binding buffer for 1 hour at RT. Glutathione coated magnetic beads were then mixed into the buffer and removed after another hour incubation. The GST tagged recombinant proteins and any bound peptide was eluted by incubating with free glutathione. The peptides analyzed by dotblot using primary antibody ab5095(1/3000) and an undiluted conjugated HRP-Goat anti-rabbit secondary antibody. This experiment was conducted with ab12795, ab18488 and an another peptide as a negative control. Secondary antibody: HRP conjugated Goat anti-rabbit polyclonal, at a 1/20,000 dilution. Publishing research using ab12793? Please let us know so that we can cite the reference in this datasheet. Review text: This peptide was mixed with GST tagged recombinant proteins in vitro in binding buffer for 1 hour at room temp. Glutathione coated magnetic beads were then mixed into the buffer and removed after another hour incubation. The GST tagged recombinant proteins and any bound peptide was eluted by incubating with free glutathione. Eluted proteins were analyzed by western blot and peptides analyzed by dotblot. This experiment was conducted with ab12795, ab18488 and an unrelated non-Abcam peptide as a negative control. Notes: Ab5095 was used to detect peptides in this experiment. Review text: This peptide was used in an in vitro pulldown assay. 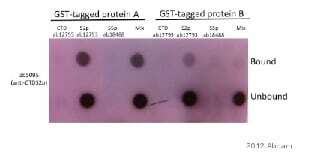 It was biotinylated and linked to streptavidin coated magnetic beads. This complex was then mixed with our proteins of interest under a variety of conditions. Proteins which bound to the CTD-S2p peptide were eluted and assessed by western blot. This peptide was used along side ab18488, ab12795, and an unrelated non-abcam peptide and binding to each CTD was compared. Additional Notes: Band was detected at 4kDa but should appear at 1.7kDa. Probably due to uncertain running of a very low MW product. Only 1 band should be present in the sample and only one band was detected. Abcam response: Thank you for submitting your Abreview. While you have been able to detect the 1.4 kDa band, we would not typically recommend this peptide for use as a WB positive control because it is very difficult to successfully run and transfer peptides of this size. The peptide is commonly used for blocking purposes. Review text: This peptide was used for dot blots to quality control anti-CTD antibodies. 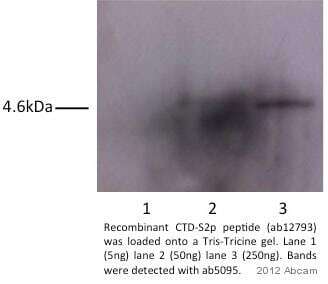 It was detected by ab5095 but not with anti-S5-CTD antibody. Notes: 0.1ug of peptide was spotted onto PVDF and membrane blocked with 2% BSA prior to antibody incubation. I would like to know the information of ab18488, ab12795 and ab12793 (peptides) which I received recently. These are the synthetic peptides, so I would like to know the purity and the chemical form of them. Please provide the detail information of them. Thank you for your enquiry. ab18488 was synthesised as >90 purity by HPLC analysis, although by weight they will contain salts and buffer components. They are supplied as a solution in the buffer stated on the datasheet. ab18488 was synthesised as an amide. ab12795 and ab12793 are both >80% purity and synthesised as carboxyls. I hope this information helps, please do not hesitate to contact us if you need any more advice or information.